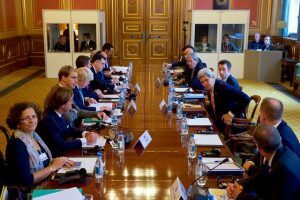 Two days of crisis talks with Presidency Council chairman Faiez Serraj began in London this morning with US Secretary of State John Kerry and British Foreign Minister Boris Johnson attending the opening session at the Foreign Office. Though the meetings, which were instigated by Washington, were to focus on the economy, the presence of the French, Italians, the United Arab Emirates and Saudi Arabia indicates that the quest for a wider political settlement is also very much on the agenda. The Libyans included Central Bank governor Saddek Elkaber with whom Serraj has had a very public falling out over economic policy, or rather the lack of it. Also there was National Oil Corporation boss Mustafa Sanallah, who has seen oil production surge since the army’s wresting of the eastern oil terminals from the control of Ibrahim Jadhran’s Petroleum Facilities Guard. Another key financial figure who was invited but did not attend was Ali Mohamed, appointed by Serraj as interim chairman of the Libyan Investment Authority. A statement issued at the end of today’s business urged all Libyan financial players to work together. One of the people not invited to the London conference was House of Representatives president Ageela Saleh. There was an unconfirmed report yesterday that he was travelling to the UK. This would have been in breach of EU travel and financial sanctions imposed on him and Libya Dawn leaders Nuri Abu Sahmain and Khalifa Ghwell this March. It is the HOR’s refusal to vote on the Libyan Political Agreement along with its twice rejecting PC-proposed cabinets for the Government of National Accord, which have helped stymy the political process. This article has been amended. Ali Mohamed did not attend the meeting as we originally wrote. An adviser said that he had stayed in Tripoli.